1. Famous brand diesel engines turbocharged and water-cooled with reliable and powerful performance feature energy. 2. Torque converter and power-shift gearbox introduced from GERMANY ZF inc. are integrated together. Six forward gears and three backward gears meet various requirements during machine’s working and transporting. 3. Driving axle with integrated free-wheel anti-slip differential and strong roller chain drive tandem case, Boxed oscillated steering front axle with leaned wheels. 4. Popular working mechanism with pendulum-arm connecting rod structure, Standard equipped free-maintenance rolling-plate circle device. Double cylinders of the blade tip control can adjust the cutting angle depending on soil quality. 5. Flexible hydraulic control system with two sets of HUSCO five way control valve, Imported hydraulic equalizing valve for the blade lifting, Patent hydraulically –operated pin drawing device is designed firstly in board. 6. Steering system with center articulate joint and tilting turning front wheels can get offset travel of the entire machine. 7. Service braking system of, caliper disc brakes on four rear wheels and mechanical internal expanding parking brake let. 8. Dual diagonal appearance with whole metal hood 1m×1m distance. -maintenance OPTIMA Sweden batteries have. 10. 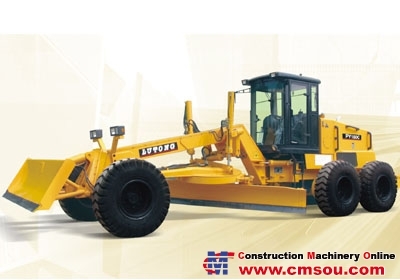 It is optional for front bulldozing plate and rear ripper.